Starting today and rolling straight through to Opening Day, Grantland will preview all 30 teams for the 2012 season. We start with the defending World Series champs. Albert Pujols is gone, but the Cardinals might be better than they were last year. They landed one of the biggest steals of the free-agent market in Carlos Beltran at two years, $26 million. They’ll get more at-bats out of David Freese and Allen Craig, which should help even if neither player approaches his postseason heroics. Most strikingly, the pitching could be a lot better, with Adam Wainwright returning from Tommy John surgery and a passel of talented, young relievers likely to see action from day one. In 667 career regular-season plate appearances, about the equivalent of a full season, Freese hit .298/.354/.429, solidly above-average numbers for a starting big league third baseman. In 71 plate appearances, about the equivalent of a long road trip — or, say, one of the greatest runs in playoff history — Freese hit an otherworldly .397/.465/.794, putting on a stretch so dominant he made Bud Selig sad for some reason. The pat answer is to always trust the (much) larger sample, that Freese is a capable offensive player, nothing more. On the other hand, Freese is a late bloomer, having made his major league debut at age 26. He’s also never stayed healthy enough to play every day for a full season. There’s no way we can watch this and this and this and not chalk up at least some of Freese’s crazy playoff run to unsustainable pixie dust. But it’s also not unreasonable for an above-average hitter to become something better than that as he hits his late 20s. There’s variance in play up and down the lineup, with Berkman a near lock to pull back after 2011’s hit fest, Beltran a potential beast if healthy but also a health risk, and Furcal likely to improve just by default. But Freese has a chance to become a top-five third baseman this year, which would go a long way toward picking up some of that lost Pujols slack. there’s no perfect system, obviously.) But Wainwright’s ability is there, and he could turn a pretty good Cards rotation into a very good one. The bigger ace in the hole is Shelby Miller, the beastly right-handed pitching prospect who ended last season with more than a strikeout an inning over 16 starts at Double-A. It’s not hard to imagine Miller replacing Westbrook in the rotation by August, especially given the aggressive way the Cardinals handed jobs to their best young arms down the stretch last season. Freese. Even if he keeps that wOBA around .350, 20 homers and a four-win season are in play if he avoids the injury bug. 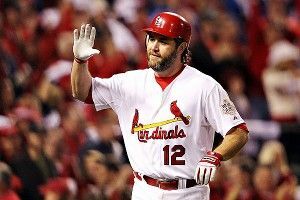 Wainwright, Freese, and Miller are the obvious reasons for optimism. But don’t forget the multiple games the Cards frittered away early last season, when Ryan Franklin(?) and Miguel Batista(?!?!?) were anchoring the back end of the bullpen. Full seasons in high-leverage roles for Jason Motte, Eduardo Sanchez, Fernando Salas, Lance Lynn, and Marc Rzepczynski could make a big difference, improving a pitching staff that was already solid in 2011 (eighth in MLB with a 3.75 team FIP). Ninety-five wins are actually possible. Yup, that would be five more than last year. Wainwright struggles to return to form; Freese doesn’t break; Freese, Beltran, and Furcal can’t stay healthy; Miller’s not ready; and the various Daniel Descalso types that Tony La Russa always seemed to leverage into wins don’t pan out this time. A .500ish season and third place in the Central if all of that comes to pass, though no LeBron-style Pujols jersey burning from the self-proclaimed Best Fans in Baseball®. Goofy hairstyles of regret are definitely in play.